HP is on a roll with its new professional looking notebooks and the latest to join it is the new 13.3-inch Spectre x360 hybrid laptop. Like its predecessor, the new HP Spectre x360 is a 2-in-1 hybrid capable of transforming between a laptop and tablet on the fly. Just from looking at the new model, it's easy to see how the new laptop has drawn inspiration from the the MacBook Air for a sharper body style. Hewlett Packard also boasts the Spectre x360 has been designed with a completely CNC cut aluminum chassis that's also been polished to a jewelry-like finish. For a 13.3-inch model it's also fairly light at 3.3 pounds (1.49 kg) and from the looks of these early product shots it looks to be quite thin as well. Despite the svelte frame, HP still claims its mobile rig has 12.5 hours of battery life. Perhaps the most re-engineered part of the new Spectre x360 is its geared hinges. 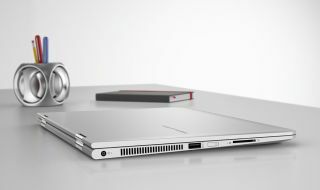 Although they looked ripped straight off the Lenovo Yoga Pro 2, HP claims it has developed a specialized connector that utilizes three spiral gears for synchronized and precise movement. The end result is a display that glides back smoothly, while staying firmly in place for tablet use or standing the device up. The hybrid laptop can be configured up to an Intel Core i7 processor with a 512GB SSD. It's also ready to connect with external displays through a full-size HDMI, DisplayPort 1.2 as well as Intel's wireless display technology. The HP Spectre x360 is will be in the UK with a starting price of £849 (about $1,310, AU$1,677) this March. A higher end HP Spectre Pro x360, meanwhile, is expected to launch for €999 (about $1,542, AU$1,973) in the same month. HP has yet to announce pricing and availability in the United States, but we will update this post as soon as new information arises.